University College London boffins have identified the genes that makes hair go grey, cause baldness and even induce the dreaded monobrow, think they can prevent all from happening. The research is outlined in a paper titled A genome-wide association scan in admixed Latin Americans identifies loci influencing facial and scalp hair features appearing in Nature Communications. The study examined 6,630 volunteers from Brazil, Colombia, Chile, México and Perú, a group chosen because it mixes Europeans, Africans and native Americans to give the study useful breadth. 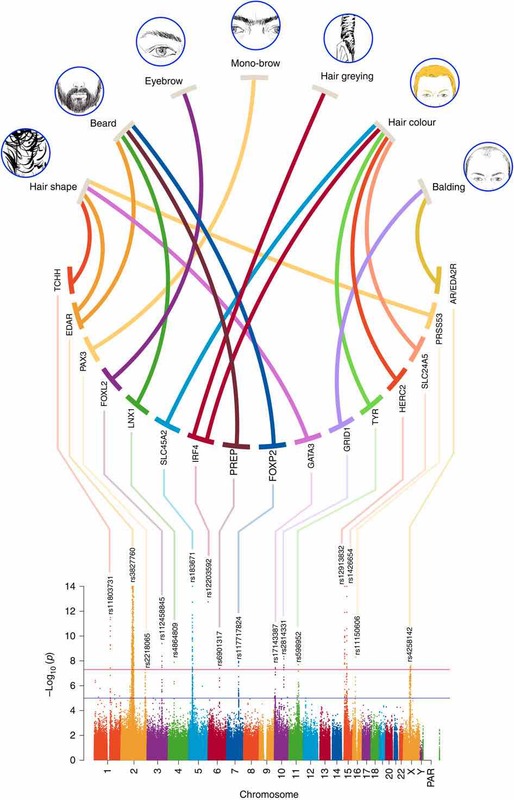 Subjects hair was categorised and their genome mapped. The result of their efforts is depicted at the bottom of this story in the form of newly-discovered linkages between certain genes and certain types of hair. For the first time we know the gene associated with going grey, with different hair shapes and with monobrows. The gene found to be associated with greying – IRF4 – turns out to be known as having something to do with the production of melanin, the pigment that helps to determine eye, skin and hair colour. The authors conclude that the gene's prevalence among the grey-haired indicates that going a bit Gandalf is genetic, not environmental. The authors also think they've identified genes associated with hair shape and that those genes are rather new, making curly hair a recent mutation.